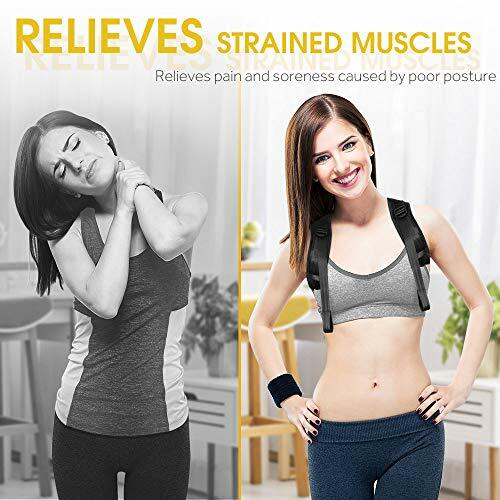 Posture Corrector | Adjustable Shoulder Stretching Harness/Brace with Detachable Pads | Chest Size 27-48"
Easy to put on and adjust. I’ve tried multiple brands and this one sensed to be the most comfortable. You don’t feel the center piece on your spin. I wear it for 15 minutes at a time. My husband can wear it all day without feeling it. 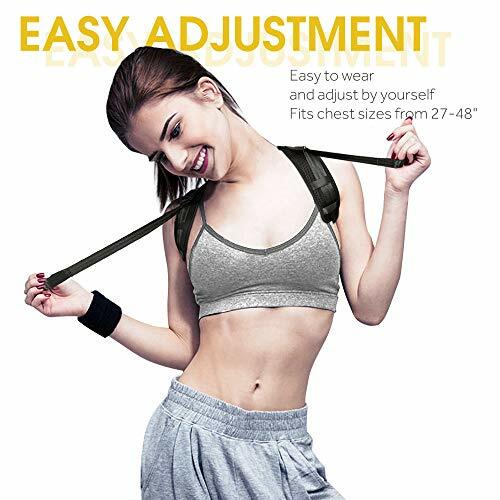 I received my posture corrector within a couple days of ordering.It was exactly as described and more comfortable than I anticipated. I am able to wear it for an hour at a time with no discomfort. It came with a case and extra pads for putting along the straps. It's still a little early for me to tell if it is making a significant difference to my posture, but I'm very pleased so far. Takes Some Adjustment, Use the Pads! Takes some getting used to, make sure you have someone adjust the back pad to make sure it's between your scapulae. Then, make sure you use the attached under-arm pads to ensure overall comfort. Wearing this provides a reminder to keep your back straight! Product works very well and is comfortable considering it works by forcing ones shoulders back. I have always wanted one of these braces because I have really bad posture. It is comfortable to wear and a good quality. It does get irritating after wearing it for awhile, but that only means it's doing what it's supposed to. The straps are easily adjustable and easy to put on. I'm sure you will like this product if you give it a try! Fits well, easy to use! I was a little sketchy to purchase one of these because I didn't understand how they would actually help and work. Once I put it on correctly I could feel the difference it was making in my posture. even just after wearing it in the morning I was standing up straighter all day. I would recommend this to anyone who needs help with their posture or to help train yourself to stand up straight. Works great! Even comes with armpit pads. This product helps me allot when I work long hours at my desk. It's a physical reminder to stay upright, but in a very comfortable way. Allot of my upper back pain is alleviated when I use this. I sit at my computer all day and do tend to slouch so I thought I would try this. I’m finding it works to a point, but I don’t fid it to be very comfortable so I can’t wear it for long. Highly recommend for back support and lumbar problems. First time using a posture corrector and it's uncomfortable at first, but I'm sure over time it will really be helpful. This is a wonderful product. 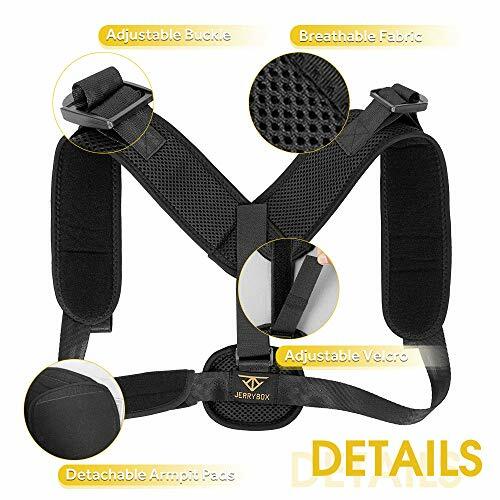 Putting on the harness very easy like wearing a backpack and it immediately improves your posture appearance. It helps to develop awareness of correct posture and stretch your shoulders and chest. 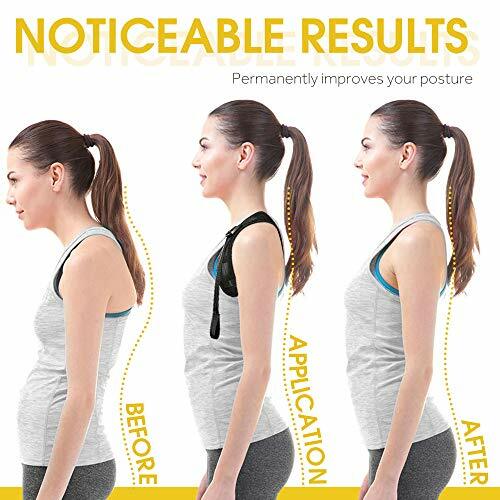 This product promotes correct posture and health. recommend this product!! Such an amazing brace. I’ve had issues for as long as I can remember and it is super comfortable with just the right amount of restraint to pull my shoulders into the right place. Can wear it under clothes without being noticeable! Definitely recommend!! It fits nicely for girl, I am about 5-6 120 pounds and it is able to adjust to my body. It is a little hard to take off but overall it works great! Just the thing I needed.. So, I work at the computer a lot and as such, my back is hunched. This is just what I needed to get my back back on track. Even with the provided pads, it can be a little uncomfortable due to the friction, though. I'm also not sure how effective this will be in the long run, but hey, it feels great. Overall, the product doesn't look like it'll break, and I can wear it underneath my clothes. Great buy, works like it says it does, quick shipping and good communication. Thank you. I buy for my wife. She like it.